Op zoek naar een plek die groot genoeg is om je hele groep te verzamelen? Zoek niet verder. Met twee volledig uitgeruste keukens, twee eetzalen en twee woonkamers, kan iedereen zich uitbreiden en hun eigen ruimte hebben. En niemand wordt in de kou uitgelaten - dit juweel heeft zelfs twee hot tubs! Ontsnappen naar luxe en comfort in deze goed uitgeruste meer dan 5500 vierkante meter huis gebouwd voor een grote familie of grote groep vrienden! Bear Hollow Village is gunstig gelegen nabij de winkels, skigebieden en restaurants. Leer bobsled, skelet en freestyle als een Olympian in het Olympisch Park Utah. Geniet van alles wat parkstad te bieden heeft. Terwijl u in Bear Hollow Village verblijft, bent u slechts enkele minuten verwijderd van Park City Mountain Resort, Deer Valley Resort, Canyons Resort en de historische Main Street. Neem uw smaakpapillen op een epicurea avontuur in een van de wereldberoemde restaurants en tavernes. en een steenworp naar het Olympische sportpark! Dit huis heeft een ruime master suite met een kingsize bed en een bubbelbad, 5 slaapkamers met queensize bedden en stapelbedden. Er zijn 3 verdiepingen met vriendelijke woonruimten! Parkeren is hier nooit een probleem, met een overmaatse parkeergarage, grote oprijlaan en veel parkeergelegenheid voor iedereen die ergens op bezoek komt. Of u nu naar Park City komt voor het skiën / snowboarden, het Sundance Film Festival, of geniet van het even aantrekkelijke zomerweer, u zult genieten van deze geweldige locatie en geweldig huis. In de lente, genieten van de zomer en de herfst, kijken naar hete luchtballonnen vanaf het dek. Verlaat niets te wensen over ... dit huis is gewoon een telefoontje weg. Bel of E-mail nu! Vijf en half badkamers voorzien van privé badkamers in de master suite (koning) en twee van de koningin slaapkamers. De andere twee volledige badkamers worden gedeeld tussen de twee slaapkamers. Highly recommend! Amazing house! Great host! We had 20 adults staying a week for a ski trip and we were very comfortable. Two hot tubs each night with a great view were a big plus! Last year we stayed in Deer Valley but this seemed more convenient as we were not 'locked' to one resort. We skied Park City, Deer Valley, Alta, Snowbird and even Powder Mountain. Plus you have options to either eat out in Park City (10-15 min away) or Kimball Junction (2 min away). Kimball junction has few new good restaurants and was much less crowded than Park City. The host was helpful with all our requests and accommodated us awesomely! Wonderful trip! Highly recommended! It was a great pleasure to host your group. We strive to deliver five star experience to all our renters. Thank you review and your recommendation. Greatly appreciate it. We were a few families with young children that stayed here. Plenty of space. Kitchen was well equipped. The large dining table was great for seating everyone so we could all enjoy dinner together. We loved hanging out in the hot tubs after a day of skiing. Thank you for taking time to write a review. Thank you for your recommendation!!! This home exceeded my expectations. Having rented large luxury homes in other Mountain resort areas I have a good gauge on quality of accommodations to the price ratio. This was by far the highest quality home for the rate requested that I have experienced. The Bear Hollow area is also much more conveniently located to amenities, the Canyons Resort and Park City than I anticipated. Uber XL rides into town were less than $20 bucks. The property management team was very accommodating for early check in and late departures as well. I highly recommend. Thank you for taking your time to write review. We are glad that you enjoyed your stay. We strive to deliver 5 star experience to our clients. Thank you for your kind words and your recommendation. Hopefully we see you again in PC. This home is one of my favorite places in the 14 years that we have been coming to Park City. The space is huge and I love the open floorplan of the main level. The two side-by-side hot tubs were amazing with a group of 8 adults. Bedrooms were good size and bathrooms were plentiful. 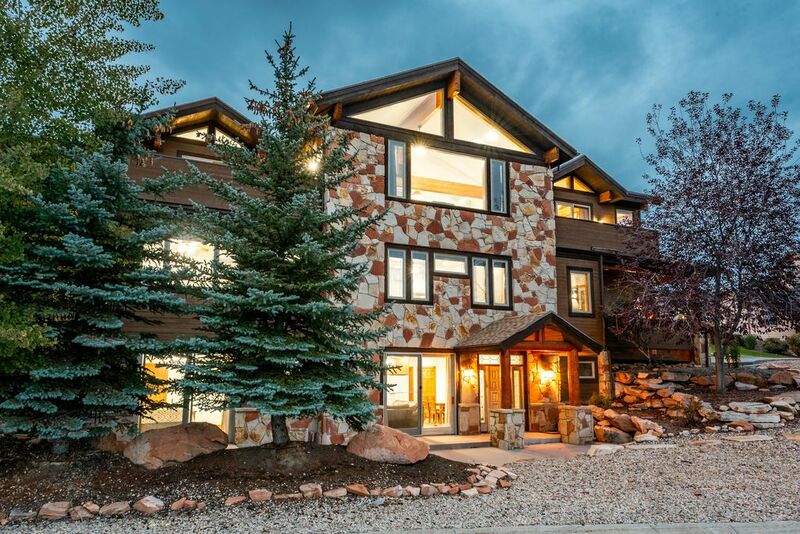 Location really seals the deal for this home -- it's minutes to Canyons, minutes to Whole Foods and other shopping in Kimball Junction, and it's minutes to I-80 which makes for a much easier trip to Snowbird/Alta or even out to Snowbasin/Powder Mountain. All in all, an amazing home for groups. We are glad you have enjoyed your stay. It was a pleaser to host your group. We greatly appreciate your review ad king words. Thank you and hopefully we see you again. Great accommodations for three families. Property Manager and staff very attentive if problems arose. Location worked great for us as we prefer skiing Canyons side of Mountain and like to avoid crowded Park City. We are glad you have enjoyed a stay. I greatly appreciate taking your time to write a review. Hopefully we see you when you are the next time in PC. This location worked really well for lodging during a customer event in the area. Everyone had their own room and we could all hang out together in a relaxed setting at night. We didn't use the pool table or hot tubs but having a garage, dryer and a tankless water heater for plenty of hot water during peak periods was very handy and noted by my customers. Property was clean, comfortable and spacious. Definitely recommend this property! Thank you for taking time to write your review. It was the pleasure hosting your group. We strive to deliver five star experience to all the guest. We greatly appreciate your recommendation. Hopefully we see you again soon in PC. Sneeuwschoenen, sleeën en nog veel meer! Tax includes: 10.50% Lodging Tax All bookings must be approved by the property manager, even those made via online booking. We reserve the right to cancel unapproved bookings that may conflict with existing booked stays.